The present corporate food regime dominating the planet's food systems is environmentally destructive, financially volatile and socially unjust. Though the regime's contributions to the planet's four-fold food-fuel-finance and climate crises are well documented, the "solutions" advanced by our national and global institutions reinforce the same destructive technological path, the same global market fundamentalism, and the same unregulated consolidation of corporate power in the food system that brought us the crisis in the first place. A dynamic global food movement has risen up in the face of this sustained corporate assault on our food systems. Around the world, local food justice activists have taken back pieces of the food system through local gardening, organic farming, community-supported agriculture, farmers markets, and locally-owned processing and retail operations. Food sovereignty advocates have organized locally and internationally for land reform, the end of destructive free trade agreements, and support for family farmers, women and peasants. Protests against--and viable alternatives to--the expansion of GMOs, agrofuels, land grabs and the oligopolistic control of our food, are growing everywhere every day, giving the impression that food movements are literally "breaking through the asphalt" of a reified corporate food regime. The social and political convergence of the "practitioners" and "advocates" in these food movements is also well underway, as evidenced by the growing trend in local-regional food policy councils in the US, coalitions for food sovereignty spreading across Latin America, Africa, Asia and Europe, and the increasing attention to practical-political solutions to the food crisis appearing in academic literature and the popular media. The global food movement springs from strong commitments to food justice, food democracy and food sovereignty on the part of thousands of farmers unions, consumer groups, faith-based, civil society and community organizations across the urban-rural and north-south divides of our food systems. This magnificent "movement of movements" is widespread, highly diverse, refreshingly creative--and politically amorphous. 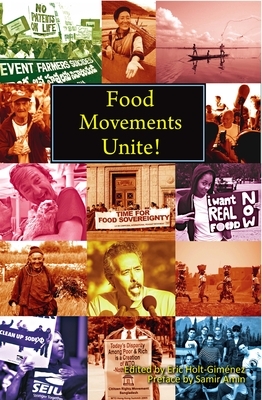 Food Movements Unite is a collection of essays by food movement leaders from around the world that all seek to answer the perennial political question: What is to be done? The answers--from the multiple perspectives of community food security activists, peasants and family farm leaders, labor activists, and leading food systems analysts--will lay out convergent strategies for the fair, sustainable, and democratic transformation of our food systems. Authors will address the corporate food regime head on, arguing persuasively not only for specific changes to the way our food is produced, processed, distributed and consumed, but specifying how these changes may come about, politically. Samir Amin is director of the Third World Forum in Dakar, Senegal. He is an economist and internationally acclaimed author of over 30 books. Eric Holt-Gimenez is executive director of Food First/Institute for Food and Development Policy. He is the co-author of Food Rebellions: Crisis and the Hunger for Justice and author of Campesino a Campesino: Voices from Latin America's Farmer to Farmer Movement for Sustainable Agriculture. Trained in political economy and agroecology, Eric has worked as a rural organizer, trainer, researcher, and professor of development studies in countries of Latin America, Asia, Africa and the United States for over 30 years. Paul Nicholson is a member of the Basque Farmers' Union (EHNE--Euskal Herriko Nekazarien Elkartasuna) in the Basque Country, and a member of the International Coordinating Committee in La Via Campesina. Horacio Martins de Carvalho is an agronomist, social scientist and consultant for La Via Campesina who looks at global food systems and Brazilian agriculture. Joao Pedro Stedile is an economist and member of the coordinating body of the National MST and La Via Campesina, Brazil. George Naylor, former president of the National Family Farm Coalition NFFC, farms grain on 470-acres in Churdan, Iowa. He is a graduate of the University of California, Berkeley (1971). Tabara Ndiaye, from the Casamance region of Senegal, is a program consultant with The New Field Foundation. She works on building the capacity of rural women's associations in French-speaking West Africa. Mariame Ouattara, from Burkina Faso, is a program consultant to The New Field Foundation in the northern Niger River Basin. She is a founding member of REFAE, a regional network of African female economists that supports gender equality in macroeconomic politics. John Wilson, free-range facilitator and resource person, is a small farmer in Zimbabwe. He helped establish Fambidzanai, a local NGO promoting ecological agriculture, and the regional PELUM Association. Groundswell International, established in 2009, is a partnership of local NGOs and resource people in Latin America, Africa and Asia, coordinated by a global office based in the US. They work to strengthen capacity for positive social change in rural communities. Raj Patel was a Policy Analyst with Food First from 2002 to 2004. He is the author of two popular books on our food and economic systems, Stuffed and Starved, and the recent The Value of Nothing: How to reshape market society and redefine democracy. Josh Viertel is president of Slow Food USA. He previously co-founded and co-directed the Yale Sustainable Food Project at Yale University. Brahm Ahmadi is co-founder and former Executive Director of People's Grocery. He recently left People's Grocery to launch a spin-off, startup venture called People's Community Market, which is developing a food retail model for inner city markets. Lucas Benitez is a farmworker and one of the founders of the Coalition of Immokalee Workers (CIW) which has waged a successful campaign against abuses of immigrant workers in the US. Jose Oliva is a restaurant worker and coordinator of the Restaurant Opportunities Center in Chicago, Illinois USA, a member of the Food Chain Workers Alliance. Xavier Montagut, president of Xarxa de Consum Solidari, is an economist specializing in international trade, responsible consumption and fairtrade. He is the co-author of several books including, Supermarkets? No thank you. Ken Meter is president of Crossroads Resource Center. He has 39 years of experience in inner city and rural community capacity building. Olivier De Schutter is the UN Special Rapporteur on the Right to Food. He teaches international human rights law, EU law and legal theory at the Catholic University of Louvain in Belgium, and the College of Europe and Columbia University. Hans R. Herren, president of the Millennium Institute and winner of the 1995 World Food Prize, is a scientist who champions integrated sustainable development. He was co-chair of the International Assessment of Agricultural Knowledge, Science and Technology for Development. Nora McKeon, formerly of the FAO, is a consultant and lecturer on food systems, peasant farmer movements and UN-civil society relations. She coordinates Terranuova, an exchange and advocacy program for African and European farmers' organizations. Brian Tokar is an activist, author and critical voice for ecological activism since the 1980's. He is Director of the Institute for Social Ecology and is a lecturer in Environmental Studies at the University of Vermont. Miriam Nobre is an agronomist, author and program coordinator of Sempreviva Organizacao Feminista--SOF (Evergreen Feminist Organization). She is part of the Economy and Feminism Network (Rede Economia e Feminismo) and part of the international coordination of the World March of Women. Rosalinda Guillen, Executive Director of Community to Community Development in Bellingham, Washington, is a former farmworker. She organized with Cesar Chavez in the United Farmworkers Union. Annie Shattuck is a Food First Fellow and graduate student at the University of California, Berkeley. She was a policy analyst at Food First from 2008-10 and co-authored Food Rebellions!